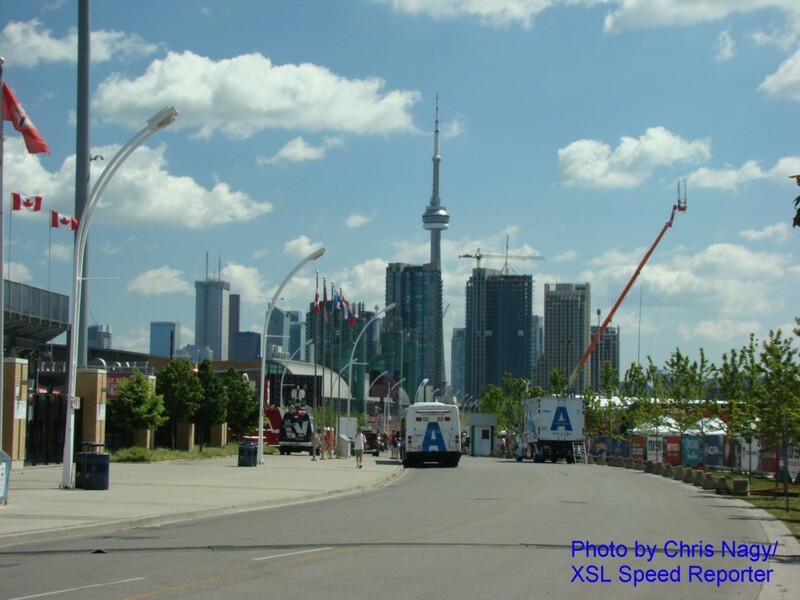 Alright, being December, I am fully aware that my entry on the 2010 Honda Indy of Toronto is quite late to be considered as current events I want to profile on XSL Speed Reporter. Due to other more pressing writing obligations has diverted my attention away from exercising more creative endeavours on this site. While my intentions is never to withdraw my dedication to completing this Honda Indy of Toronto review, time was never on my side. Being better late than never, I will hopefully allow you to reminiscence of the dog days of summer while much of Canada becomes covered with snow. Following the productive year I had in 2009, I thought all I needed to do to make this year's coverage perfect was to add more updates and bring sunscreen (it took two weeks after last year's Honda Indy to overcome have serious sunburns on my face, neck and arms). Regrettably, I admit I was unable to attend this year's race in the official capacity of a member of the media. Having been granted the honour of media access last year, this first time experience didn't allow me to fully make use of my press flexibility. It was my intention to avail readers of XSL Speed Reporter to exciting coverage. 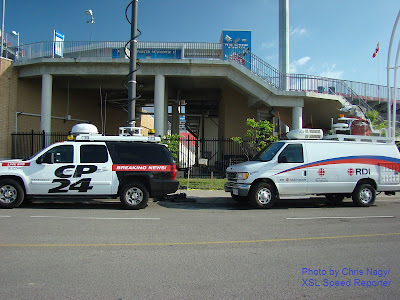 Maybe representing the latest resurgence of IndyCar after reunification, larger media outlets (including many television stations which were not even present for Friday on 2009) covered the action of the first day of the Honda Indy weekend. 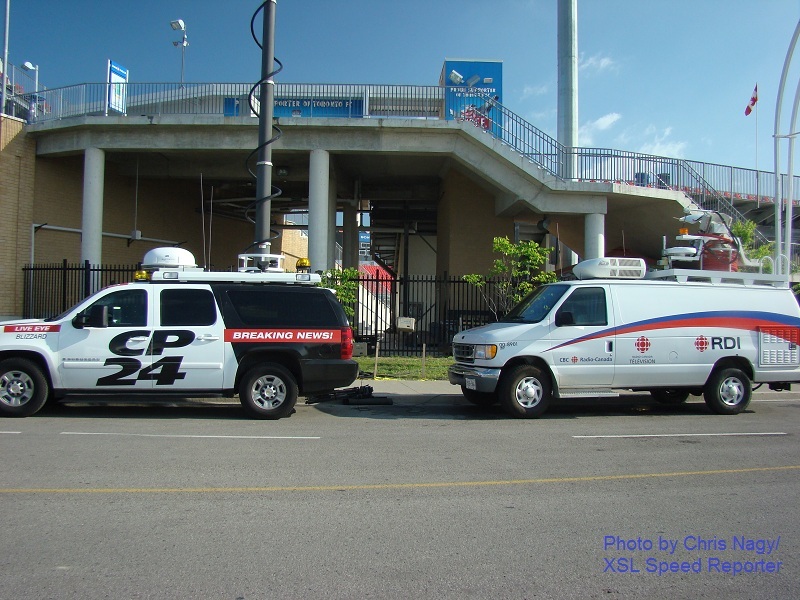 It would also be a relief that this year's general media presence were a little more accepting of the 2010 Honda Indy of Toronto. The 2009 event was almost slandered by sports writers more familiar with 'stick and ball sports'. More positive of the event, there was still articles questioning the presence of the major Canadian auto race. As was the case last year, the race promoters did not publicize spectator numbers but I imagine media outlets simply observe the grandstands expecting everyone to be seated throughout the race weekend. For anyone who attends an IZOD IndyCar Series road or street course event, you know that this is unlike many year-round sporting events that last only for a few hours. The Honda Indy of Toronto is a three-day festival which encourages spectators to bask in the sights and sounds of the July atmosphere. While lacking the press access, my love for the event would allow me to forgive my non-inclusion as a reporter. Coming on Friday for the 2010 Honda Indy weekend, I looked forward to again attend the race action as a spectator. Thanks to Honda Canada had provided a Free Friday promotion (giving patrons a chance to absorb the true amazement of the auto racing action) I can attest anyone attending the race was given almost as much freedom as I had last year in viewing to on-track action. As ambient high temperatures sailed past the mark of 30 degrees Celsius. Arriving in the early morning for the CNE grounds via the TTC streetcar, I Iucked out that a gentle rain shower had long ceased with much of the evidence evaporated under mid-summer temperatures that resided inside the 20 degree range. Following a short TTC street car ride, I was enjoying the chance to relish my attendance of the 2010 Honda Indy of Toronto. At the gate, spectators were endorsed to donate fairly to the Make a Wish Foundation Canada. While Free Friday was worth while for fans, there is not one fiber of my being that would not appreciate this charity drive. After making a proper donation, as did many considerate race fans, I was treated once again to one of the more thorough security checks ever instituted at a sporting event. Bags were checked (which for me pertained to only my camera bag) and food or drink were prohibited beyond the gate. While I give the benefit that this is done for safety, the looks of the concession stand pricing inside the event would definitely need some kind of 'outside food ban' to keep brisk business. But, high prices at food and drink concession stands is only part of the sporting event experience. 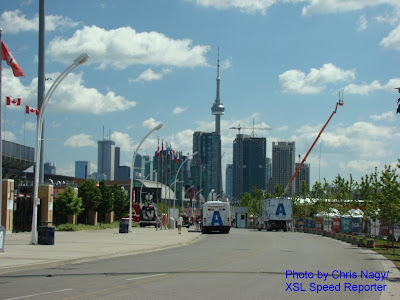 As I cleared the front gate to the CNE grounds, my 2010 Honda Indy of Toronto experience started by appraising the paddocks of 6 individual racing series'. Four of the six touring exhibits were found inside of the Direct Energy. Throughout the day, the shelter of the cooler Direct Energy building served some comfort as the July sun and humidity beamed over Toronto. Passing the fleet of Honda Ridgeline trucks destined to parade the drivers of the IZOD IndyCar Series prior to Sunday main event, passage through the Direct Energy Center gave me a look at the Acura World Challenge and Trans-Am on the right side of the building's interior. Far to the left, the NASCAR Canadian Tire Series transporters and teams were assembled. Inside Direct Energy Centre with Honda Ridgeline ceremonial vehicles in view. Becoming a oven-like warm Toronto morning, the grounds of the CNE were ripe with activity. The more stabilized and recognized IZOD IndyCar Series as well as the Free Friday promotion was clearly making an impact on attendance. As perhaps the most assuring signal was the presence of families at the race track taking in this affordable sporting event. Compared to Toronto Blue Jays tickets cost around $50 for cheap seat viewing at the Roger Center or a Toronto Maple Leafs game costing at least $150 to $200, the Honda Indy of Toronto provides refreshingly wallet-friendly trips for parents careful amidst these complicated economic times. Even though concession prices could make lunch a more expensive than usual, the no-charge admission succeeded in offsetting that cost. As I stepped outside, my ears were ringing with an enchanting sound of race engines bellowing around the temporary 2.84-kilometer (1.765-mile) street circuit. Taking to the track early was the 2010 SCCA World Challenge and Trans-Am series competitors. Knowing that the sports cars were positioned as a supporting attraction to the open wheel racing, the sound of these vehicles echoed the best sound of any car competing during the Honda Indy of Toronto weekend. The sight of Volvo S60, Lexus IS300 as well as Volkswagen GTIs in race trim provided a roar which could be compared to a mix between Formula 1 and a Grand Turismo video game. Wall Street: Money Never Sleeps. Acura Sports Car Challenge vehicles and SCCA Trans-Am series race cars returned for a second practice during the afternoon ahead of their Saturday afternoon event which saw the Realtime Racing Acura TSX piloted by Peter Cunningham win the GTS class. 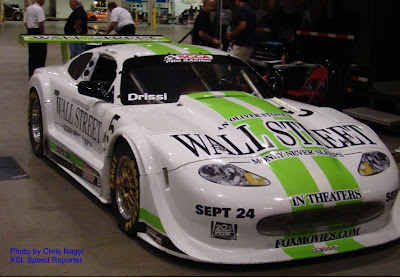 Randy Pobst took a close 0.821 second victory in the GT Class with a Volvo S60 as Montreal, Quebec's Kuno Wittmer came home 6th in a Dodge Viper. SCCA Trans-Am Series race's pole was snatched by the Jaguar XKR of Tomy Drissi but the Honda Indy of Toronto race was claimed by RJ Lopez (a first-time series win by the Dominican Republic native) and his Corvette by a nealy 9 second margin. Stouffville, Ontario's Blaise Csida retired with only 21 laps on the board with a mechanical problem. Randy Pobst's K-Pax Volvo S60 on Friday. Back to Friday morning as the Honda Indy of Toronto was still a memory waiting to happen, the IZOD IndyCar series took to the track for their first practice of the 2010 event. The headliners of the July weekend speed festivities, the array of drivers such as Will Power, Helio Castroneves and Dario Franchitti all returned after running last year's event (the first under the IRL/IndyCar Series structure). It was also the return for 2010 for the 2nd Newman/Haas/Lanigan Racing car driven by Graham Rahal. Of course, being one of two Canadian rounds for the major open wheel racing series, Paul Tracy rejoined the tour alongside French-Canadian regular Alex Tagliani in competition. Tracy was running his 2nd race of the season after driving for Dreyer and Reinbold Racing at Watkins Glen in place of the injured Mike Conway. Graham Rahal ahead of his first practice back with NHL Racing for 2010. 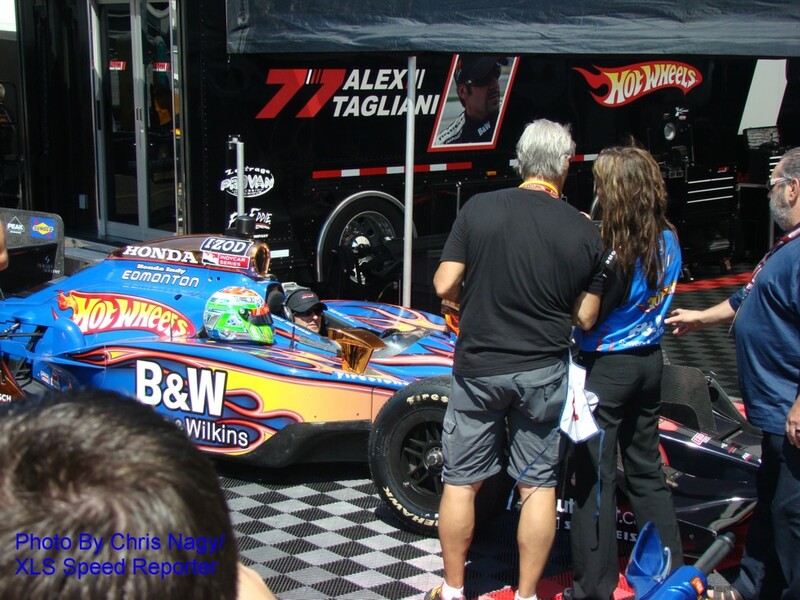 Just like the 2009 event, the IZOD IndyCar teams paraded from the paddock area to the pit lane ahead of every session allowing fans to get a look at their favourite Dallara-Honda Indy cars and drivers. Compared to 2009 where Patrick moved like a flash between locations shielded from view, the popular IZOD IndyCar driver turned over a new leaf in respecting the Canadian race fans. Upon my first sight of her ahead of the first IZOD IndyCar series practice, Danica Patrick would walking down gasoline alley smiling as she cheerfully signed a few autographs. Whether the pressures of her sponsors through IndyCar as well as NASCAR in 2010 or an improved mood, the more congenial Danica Patrick was no less than a welcomed inclusion for the 2010 Honda Indy of Toronto. Danica Patrick embracing her usually abundant fanfare. Danica Patrick along with Simona de Silvestro and Milka Duno were the female composure of a very diverse grid for the 2010 race in Toronto. With the G20 Summit gathering occurring just three weeks prior, the IZOD IndyCar Series presented a rich international representation of drivers from 12 different countries. Even though the Honda V-8 engines buzzed loudly along the Toronto lake shore, its arguable the race action was more peaceful. The first time to measure up the competition for the event, the one hour session was led by Target/Chip Ganassi Racing's Scott Dixon over Justin Wilson by leading the circuit in 1 minute, 3.9149 seconds. Within several minutes of the green flag being displayed for the 2010 IZOD IndyCar Series cars, the KV Racing #5 car of former Formula 1 driver Takuma Sato lost traction through the final corner backing his car into a retaining wall. Assisted by the safety crew, Sato was able to restart his car suffering a loss of his rear wing. Belgium's Bertrand Baguette also left the first practice session with damage to his #36 Conquest Racing car. Being the first visit to the Toronto circuit, Baguette was continuing a hard-fought rookie campaign in the IZOD IndyCar Series which started at the 3rd race of the 2010 season. Third-fastest in the first practice session, Alex Tagliani and the FAZZT Race Team posted an effort many home country fans were eagerly seeking from the #77 car. Driving the Make a Wish Canada #15 car, Paul Tracy could only muster a 15th place run against 26 cars. Being Canada's drivers, both Tagliani and Tracy appeared to have a higher than usual amount of obligations to press as well as sponsors. Ahead of noon, Alex Tagliani's FAZZT Race Team's presided within the IZOD IndyCar paddock spotted for one media engagement. Getting in and out of his Hot Wheel-sponsored #77 car, an adoring crowd surrounded the Canadian racer. As the IZOD IndyCar Series left the track, the Firestone Indy Lights support series were next to lap the circuit starting their practice quarter past 11 in the morning. Leading the series points, J.K. Vernay was ahead of Charlie Kimball and Oakville, Ontario native James Hinchcliffe. Personally having the pleasure of interviewing Hinchcliffe ahead of the Honda Indy of Toronto for PRN Magazine, it was clear to me that a Firestone Indy Lights victory on the temporary race track for the 24-year old would be a major career achievement. In preparations for the Toronto 100 race, James Hinchcliffe would claim fastest time in the first practice. Venturing around the race track all morning, I face much of that time attempting to find a source of refreshments. As I have already singled out the concession stand prices, it may be obvious it was an issue with me. Being a frugal deal-hunter, I have trouble spending almost twice the price for drinks. In hindsight, I probably should have been more willing to forgo an expense. Drinking fountains were few and far between on the CNE grounds with me eventually finding one inside the Direct Energy Center to refill my empty water bottle. Past noon time, I believe I was in the early stages of dehydration as I began to feel ill effect for not bracing for the elements. Clearly, I was alright after sitting down for about an hour inside the Direct Energy Center after recovering some water. A productive and enjoyable morning at the 2010 Honda Indy, a brief rest reinvigorated me for what would be an even better afternoon.